In Austria and Croatia, female employees have the same legal rights as their male colleagues. However, the career opportunities are far from equal. Figures from the last Eurostat report show clearly the gap. Additionally, many discriminating stereotypes including language issues still exist. Communications and consulting industry are quite specific related to the gender equality. 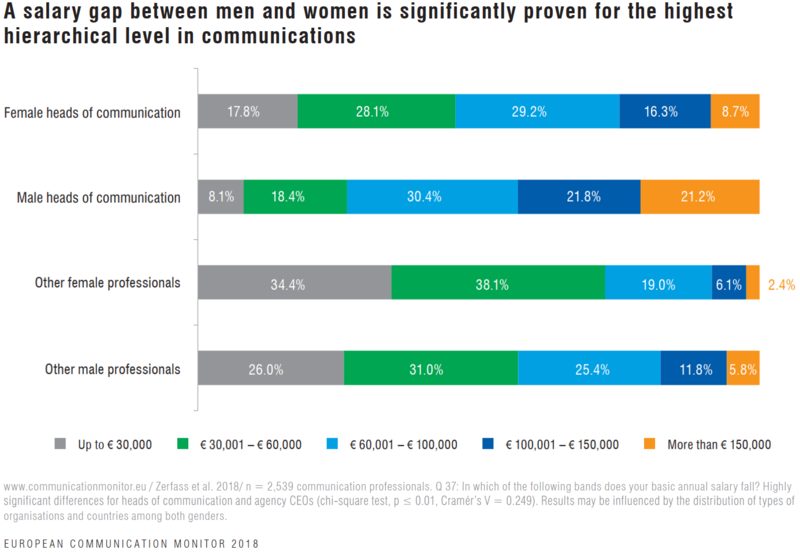 However, according to the last edition of the European Communication Monitor 2018 research, the pay gap between men and women is present in this industry as well, specifically in leading positions. Communications consultancy is increasingly female, while on the client side, this is only true for the majority of communication, CSR and HR managers. Our counterparts at executive management level as well as in finance and controlling departments are predominantly men. Therefore, our focus is on the one hand to support larger companies to work towards gender equality, and on the other hand to fight in all areas against any discrimination and for more equality in leading positions. In a company like ours, that employs more women than men, the needs of female employees get the necessary attention automatically. Based on our yearly workplace assessments, we design and adapt our working conditions regularly. For years, our employees enjoy flexible work options, and we try to overcome any discriminating stereotypes. We are signatory to the Diversity Charter Croatia and will soon present our Diversity Policy and report on diversity and inclusion initiatives in our company. Our Managing Director Croatia Daria Mateljak is Diversity Charter Ambassador and actively advocates on D&I topics. Additionally, we consult our clients in D&I management. Respecting women’s rights and supporting women’s empowerment across the workplace, marketplace and community. Offering flexible work options, leave and re-entry opportunities to positions of equal pay and status. Paying equal remuneration, including benefits, for work of equal value. Supporting women’s leadership and ensuring sufficient participation of women in decision making and governance bodies at all level and across business areas. Ensuring that business activities, products and services respect the dignity of women, and do not reinforce harmful gender stereotypes. Partnering with relevant public and private stakeholders, such as labor unions and NGOs, to advance gender equality in the work place, marketplace and community.